The country of origin of the ice plant is Africa. It is called the plant that absorbs salinity by the succulent plant. It came to be called the ice plant from it was, and seeming frozen the particle that looked the leaf surface and on the reverse like the crystal of ice. This photograph is the one of just planting the ice plant seedling. The grain grain on the surface of the leaf doesn't seem to have frozen so much because it is small still. However, it is seen that there are a lot of particle. The ice plant flower seems to be white and to bloom the flower like the fig marigold like the sea anemone. The bud of the flower has a red, small shape. The ice plant absorbs salinity. The ice plant is a changeable plant that absorbs the salinity contained in the soil. To use it for the salt damage measures by using this except salt function, the research is done. There is a feature that saltiness is, and when it eats the life, it grows and it seems to have come to ship it to the market. When a harmful heavy metal such as cadmium is contained in the soil when the ice plant is planted in the soil and it grows it, it is necessary to note it because these are absorbed more than general crops, and there is a character to accumulate. The leaf surface and on the reverse ,there is a cell to save salts (mineral element) of Bladder Cell. It seems to have frozen because there are about 2 mm diameter, and it shines transparently. As for the ice plant, the nourishment in a usual vegetable without is abundantly included. Especially, a lot of nutrients that are are the citric acids, the malic acids, potassiums, magnesiums, calciums, the pinitols, and myoinositols, etc.The citric acid and the malic acid are effective in the tiredness recovery. The myoinositol that prevents an increase of the pinitol and fat that lowers the level of sugar in the blood is effective against the lifestyle disease. The leaf is vivid green in feeling like lettuce. It is a texture that blue stinks when eating it is not, and in a light taste, without saltiness and acidity before. It is recommended that how to eat the ice plant makes to the salad and eats the life. It can enjoy a peculiar saltiness and texture to the ice plant. It is possible to use it to cook variously because there are saltiness and a texture of [shakishaki] and [puchipuchi] even if heat is passed. The dish looks better by assorting the shine such as vivid green and crystal when making it to the garnish of the dish. 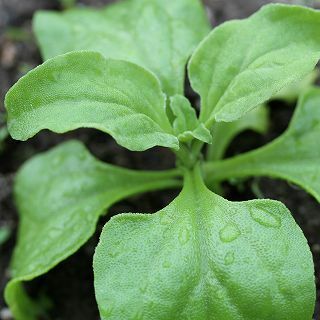 The germination temperature of the ice plant is about 20℃. Because the seed is small to sow and to come, it sows to a damp beforehand soil. Moreover, it makes it to extent where the seed is hidden without thickening the soil covering. When the leaf becomes about 4-5 after it germinates, it transplants. It transplants sequentially from a large seedling because it doesn't often germinate all together. Because the root is especially weak, it plants carefully and it substitutes it. Please get much sunlight, and put cool place. Cultivation by the planter might be better than it grows it in the outdoors. The best growth temperature of the ice plant is about 5-25℃, and the lower lobe withers and the stock weakens on the day etc. that exceed 30℃ at the midsummer. It can be bred even by the cuttage though breeding by the seed is general. The root comes out only put into the water. This is only planted in the soil.